how do I remove first two parts of breadcrumb? Does anyone know which file to edit the breadcrumb so that I could remove the firest two parts showing in thsi screenshot http://i.imgur.com/b1Mee.jpg ? Reason I want it out is because the link home goes to my index php which is just my option to remove but the forum link it links to the main forum page that I cannot add widgets or modules into. Its shows the complete wide view and no modules could be put (too empty). Many thanks. I just copies the whole thing and paste it then wallah. Getting to like WordPress even more. Also works around my issue with Customizr theme, thanks! 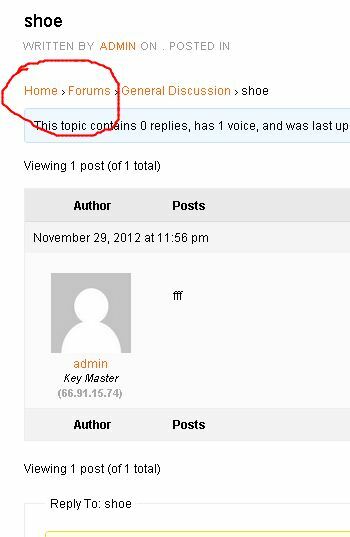 Hi, is it possible to replace the forum root (in your above example) with a url of my choice? @netweb Thanks a lot! Your filter still works like a charm. Necro. I am using the Evolve theme, WordPress 4.5.3, and have tried running this code in a child theme, but the effects only take place in the parent theme’s functions.php. I tried a mu-plugin as well. I am thoroughly pleased with the results in the parent theme but would love this in a child. Any thoughts? Got around this by using this solution and just modified the links to be more to my liking; it is working in a child theme functions.php. The Forums root, or Forums Index, is going to be the death of me. @netweb I tried using your code in my site’s function.php, however, the code did not work and in fact caused display errors. I noticed that this post was a few years old. Do you know how the code would be updated to work with current bbpress? I need to remove the Home breadcrumb specifically. The forum and topic breadcrumbs are fine. my style pack plugin lets you amend breadcrumbs, including not showing the home breadcrumb. Thank you so much for the plug-in. Definitely helps in removing the home plug-in. Will this plug-in, also, allow me to replace the Home in the breadcrumbs with a post that the forum is attached to? @robin-w I clicked the box for disabling the home breadcrumb, and the home breadcrumb still appears using the plug-in. The plug-in allowed me to disable all breadcrumbs, but it’s not allowing me to remove the individual home, root, or current breadcrumbs. could be various reasons why this is happening – you have also posted in my style pack support forum, so I’ll pick it up there.